Belt with steel buckle for members of the German Jungvolk (J.V.). 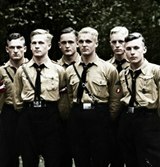 This youth organisation, part of the Hitler Youth (H.J. ), initially captures boys aged between 10 and 14 years. By 1939 there were to join mandatory all young people up to 18 years. The buckle is marked on the back: RZM U.E. 72 while the leather belt, of the type with "political" hunger, is marked internally: J.V. Ausfg. 2 L 2/24. Uncommon belt in excellent condition. Notify me of updates to Belt for the Jungvolk.